The other is to nest things. Sometimes, like in most 3D models or when using 2D systems like Spine, is to have a nested hierarchy. The engine can handle both, without any impact on performance or behaviour. If you decide to go for the nested way, make sure you set the Animator and Model in the top level’s Character’s inspector. The system can work with any kind of character. It can be 2D, 3D, it’s up to you, really. The asset includes examples of classic, sprite based characters, Spine powered ones, and 3D models. 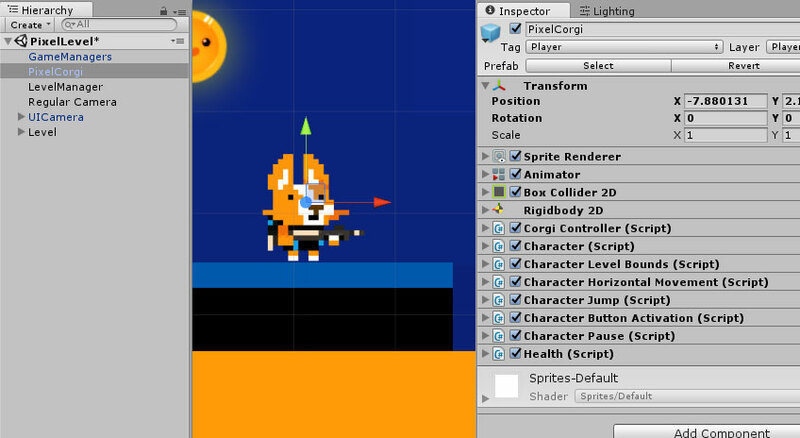 For the Corgi Controller to work, your character needs to have a BoxCollider2D component on it (even if it’s a 3D model). No material, IsTrigger set to true, the size that matches the parts of your character you don’t want to go through walls (possibly your whole sprite size, but not necessarily), and an x offset set to zero. The Corgi Controller is at the heart of this system. It’s the basis for each character. Its main function is to handle collisions, and basic movement. You’ll be able to add or set forces to it, usually via Character Abilities, which will make it move. To handle collisions, the Corgi Controller uses raycasts, which you can see in the scene view when playing your game. Basically how it works is that the controller is casting small rays all around itself, like tiny lasers. If a horizontal laser hits something, then we’ve probably hit a wall, or a slope. If a vertical ray hits something, we’ve hit the ground or the ceiling. Depending on the forces being applied every single frame, and based on whether or not the raycasts hit something or not, the controller will move the object around the scene, or make it stop to prevent it from entering a wall for example. Being at the center of your character, the Corgi Controller’s inspector settings are quite important. There you’ll be able to define the gravity, various speed factors, what slopes the character can climb (and at what speed). By default, the engine comes configured with a number of layers, and there’s one for each of these platforms : Plaforms, MovingPlatforms, OneWayPlatforms, MovingOneWayPlatforms respectively. If you add more layers, or change these, make sure to replicate these changes on your characters. From the inspector you can also customize the raycasts. Their number really depends on the size of your character. What you’ll want to achieve is as few raycasts as possible (for performance reasons, even though raycasts are not really an issue these days), but with raycasts close enough to each other that no platform/enemy/whatever could fit between two raycasts (and in this case wouldn’t be detected by the engine). Every level has level bounds, defined on the LevelManager. It’s the invisible line to the left/top/right/bottom (actually visible in the scene view, it’s that yellow box with “Level Bounds” written in the top left corner) that defines where the camera will stop. Using this component, you can decide what happens to your character when it meets these bounds (usually either nothing, constrain or death). This is the central class that will link all the others. It doesn’t do much in itself, but really acts as a central point. That’s where you define if the player is an AI or player-controlled, how it should flip, if it’s model based, stuff like that. It’s also the class that will control all Character Abilities at runtime. It’s a very central class, at the core of the v3.0 update. From its inspector you’ll be able to define a few things. If it’s a player character, the PlayerID field is very important. It has to match exactly the one in your InputManager (that’s how the InputManager knows what characters to control). Then there’s basic setup stuff, like what direction your sprite/mesh is facing initially. You can also specify an animator, if your animator isn’t on the top level of your hierarchy. Same thing for the Model (which can be 2D or 3D or whatever you prefer). The last (but not least important) part of your character will be the Character Abilities. The asset comes packed with more than 15 abilities, from simple ones like HorizontalMovement to more complex ones like weapon handling. They’re all optional, and you can pick whichever you want. You can of course also easily create your own abilities to build your very own game. You can check this page for more details about Character Abilities.